What is “Gangnam Style”? You’ve perhaps seen the YouTube “Gangnam Style” music video that went viral within weeks. Or maybe you’ve heard of PSY – the artist behind “Gangnam Style”. You’ve possibly even tried to do the “Gangnam Style” galloping horse dance moves in the privacy of your own home… or in public if you’ve been daring enough! “Gangnam Style” flash mobs have popped up all over the World celebrating the crazy dance music phenomenon of “Gangnam Style”. There have even been some very funny parodies of the “Gangnam Style” music video (more on that a little later). So the question is (for those of you unfamiliar with K-Pop) who is PSY, the chubby South Korean star of “Gangnam Style” and what does “Gangnam Style” even mean? “Gangnam Style” (Korean: 강남스타일) is the hit single by South Korean rapper PSY. The song was released on 15 July 2012, as the lead single of his sixth studio album PSY 6 (Six Rules), Part 1. “Gangnam Style” debuted at number one on the Gaon Chart, the national record chart of South Korea. On 21 August 2012, “Gangnam Style” officially charted #1 on the iTunes Music Video Charts, overtaking Justin Bieber’s “As Long as You Love Me” and Katy Perry’s “Wide Awake”; this feat is the first for any South Korean artist. As of 19 October 2012, the music video has been viewed nearly 500 million times on YouTube, and is the site’s fourth most watched video and most watched K-Pop video. Big Bang members Daesung and Seungri appear in the video as two old men playing a board game in the park; they are the two men flying in the background after the explosion. Hwang Min-woo, a 5-year-old boy who appeared on Korea’s Got Talent and is seen dancing at the beginning of the video. Yoo Jae-Suk in a dance duel with PSY. Yoo is one of Korea’s top comedians and is known as Korea’s “MC of the Nation”. Comedian, No Hongchul, dancing in an elevator with his trademark pelvis-thrusting, with PSY rapping underneath him. “Gangnam Style” has been praised for its catchy beat and PSY’s amusing dance moves in the music video and during live performances. On 17 September 2012, the song was nominated for Best Video at the upcoming 2012 MTV Europe Music Awards to be held in Frankfurt, Germany. On 20 September 2012, “Gangnam Style” was recognized by Guinness World Records as the most “liked” video in YouTube history. On 30 September 2012, Gangnam Style reached #1 on the official UK Singles Chart making it the first K-Pop single to do so. Riding high on the success of “Gangnam Style“, it was announced on 4 September 2012 that PSY had signed by American talent agent Scooter Braun to Braun’s Schoolboy Records, a label distributed by Universal Republic. Scooter Braun is famous for discovering Justin Beiber on YouTube. 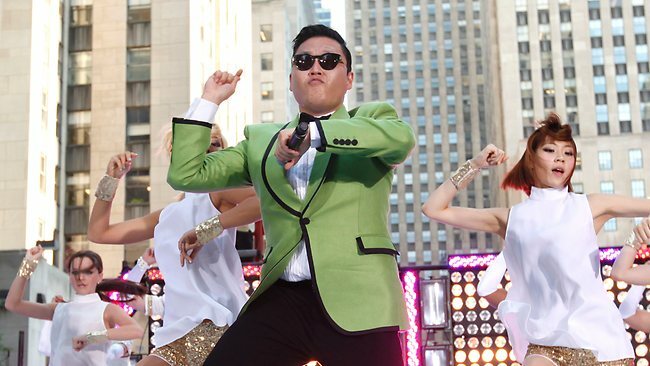 The “Gangnam Style” music video has become a source of parodies and reaction videos by many different groups. The latest one – and perhaps the best and funniest so far – was filmed by the boys of the famous English public school, Eton. Here are the UK’s future movers and shakers (and perhaps our next Prime Minister!) doing it Eton Style. “Gangnam Style” is a Korean neologism that refers to a lifestyle associated with the Gangnam district of Seoul, where people are trendy, hip and exude a certain supposed “class”. The term was listed in Time’s weekly vocabulary list as a manner associated with lavish lifestyles in Seoul’s Gangnam district. PSY likened the Gangnam District to Beverly Hills, California, and said in an interview that he intended a twisted sense of humour by claiming himself to be “Gangnam Style” when everything about the song, dance, looks, and the music video is far from being such a high class. Tagged dance, music, YouTube. Bookmark the permalink.